I am delighted to be back after weeks of camping in our new home amidst shoals of unpacked boxes and splinter-prone bare floorboards. A highlight of my blog-off time was meeting Alex Piros (above) of "BeGoodStayGood" who produces hand-bound notebooks and pretty paper goods. Loveitback met up with her on a hot and humid London afternoon in St Pancras station hence the setting for most of the pictures! Alex has a stunning smile and while in fact she is German, she speaks a flawless American accented English. One of the reasons I was happy to include Alex on this blog is that while her goods are not made 100% from recycled materials she is making determined strides in that direction, and is setting a great example. Her personal ethos is to tread as lightly as possible to reflect her vegan principles. There's a sort of deceptive simplicity to Alex's products that is rather beguiling. The Flutter Book in the main picture above is made from folding and cutting an A3 size piece of paper; the end result could be used for a photo album, love messages or as a notebook. I loved the idea that it could be re-formed into an A3 poster and that when you stretch it out, it flutters like a butterfly. It retails for a mere £4.00. Another that grabbed my imagination was the Secret Pocket Book (£15.00) with a hidden binding and ingenious folding flap for holding/hiding anything you might want! It was a bit dark in the cafe so I have flooded the picture with light to reveal the folding flap. The harsh truth for someone in the hand-crafted paper business is that recycled paper doesn't have the same feel as top quality stuff. That said, Alex, who diligently studies developing trends, has noticed a burgeoning demand for recycled hand made paper. That said, it has become clear to her that many in her target market consider beautiful handmade paper goods too precious to actually use. 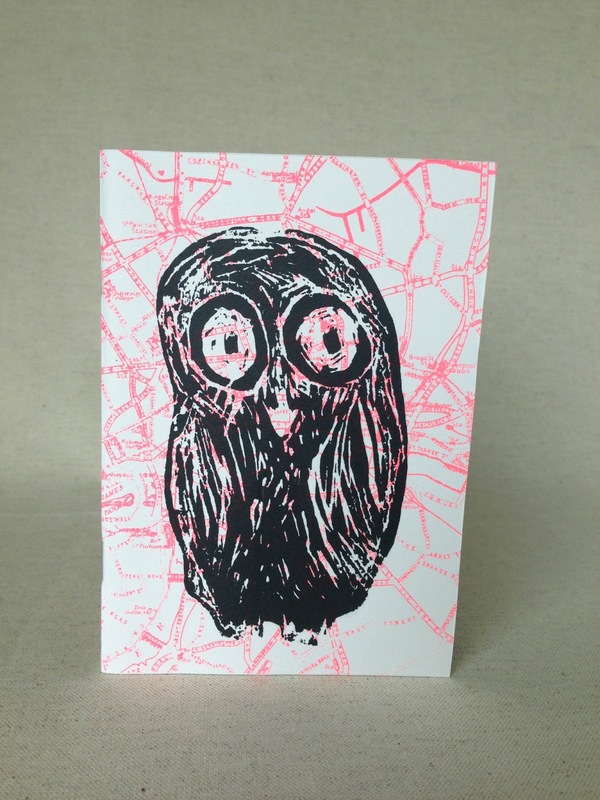 In response, Alex makes stapled booklets out of recycled paper with covers that she designs (above) and says they sell well. She also carefully hoards scraps and uses them for labels. With cards like these she makes as many as she can out of one piece of paper with the inevitable result that they are smaller than the envelopes which barely matters! Alex says she first began in this line of work because she was bored of black sketch books and wanted to make them more visually interesting for use by artists as well as non-artists. I wanted to make books you could throw around and that would stand up to actually being used. In fact, my books hold up really quite well!" 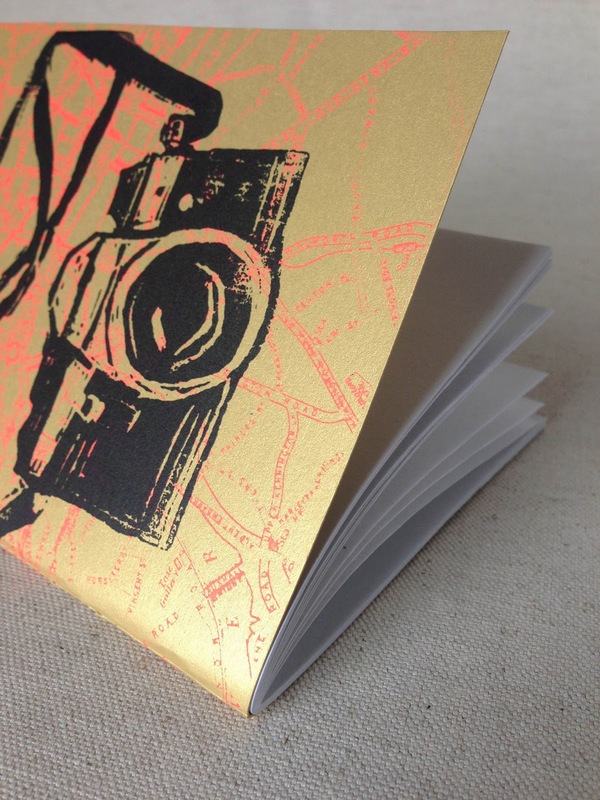 Alex cooperates with other designers and artists such as Carole Villain on these gorgeous screen printed jotters. Ever the businesswoman, Alex is planning to expand into producing tea towels, gift wrap paper, limited edition prints, bed sheets and pillow cases. And finding ways to incorporate recycled materials will be top of her agenda.